AAPI (All American Physicians of Indian Origin ) invited Guruji for a key note address in Orlando. And of course when He was going to be in town , the devotees are never far away to seize any opportunity to be with Him. How all of us always find reasons, excuses or actually create some, just to be close to the master. The event preparation started in Orlando and after a week of jet speed preparation as the event was three and a half weeks away, we got the hall, the ticketing company, only to know that the open event is being shifted to Tampa 🙂 . Now two and a half weeks to go, we have a brand new team, new city, new preparations but the same goal, Gurudev. What I felt was jet speed, turned to lightning now. The mistakes, learnings, experiences from Orlando helped jumpstart the event. With a great team up our sleeve, Rathi and Vatsan as coordinators, we took long deep breaths so very often. All set with the plan, we wanted to make the Tampa evening special, an intention to contribute, and lots of actions to compensate. Lots of new ideas, premium exclusive seats, different ways to outreach, corporate involvement and we thought we had done our best and then came the crowning glory news. 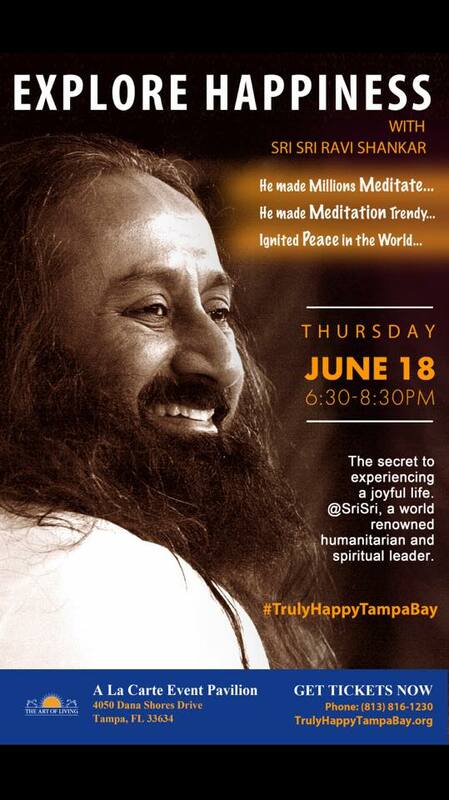 The Mayor Bob Buckhorn of Tampa Bay City has proclaimed June 18th as “A Day of Happiness” in the City of Tampa, Florida and urges all residents to join in welcoming Sri Sri Ravi Shankar to our city. The Mayor also recognizes the Art of Living Tampa with the goal of making Tampa a more peaceful, happy and spiritual city that will set an example for the entire nation. What started as an evening , became an event and today will be an era in making for the city of Tampa. The opportunities Gurujis gives, the challenges we face in making it happen and all the circus with it surely is a test to explore our happiness eventually. Welcome to the world of Explore Happiness on June 18 at Tampa Bay, tickets at www.trulyHappyTampaBay.org . The purpose is to play! !